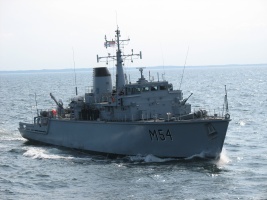 Jan­u­ary 3, change of com­mand cer­e­mo­ny will be held at the Baltic Naval Squadron (BALTRON) in Liepa­ja, Latvia. The cur­rent com­man­der Lt Cdr (Lithuan­ian Navy) Andrius Širvys will hand over duties to Lt Cdr (Lat­vian Navy) Dmitri­js Jankovs. BALTRON staff will rotate as well. Lt (N) Egidi­jus Oleške­vičius will rep­re­sent Lithua­nia as BALTRON Chief of Staff, Lt (N) Egidi­jus Mickus as Staff Sig­nal and Com­mu­ni­ca­tions Sys­tems Offi­cer and CPO Tomas Donauskas as Staff Admin­is­tra­tor. Last year BALTRON Staff also includ­ed Lithuan­ian Oper­a­tions Offi­cer – Lt (N) Klevas Tubis. Mine coun­ter­mea­sures ves­sel KURŠIS M54 of the Lithuan­ian Navy begins a half-year tour of duty in 2012 as well, the ship is under the com­mand of Lt Cdr Tadas Jablon­skis. It will replace com­mand and sup­ply ship JOTVINGIS N42 led by Lt (N) Vytau­tas Šakalys. Accord­ing to the BALTRON Activ­i­ty Plan in 2012, BALTRON staff and ships will par­tic­i­pate in BALTRON train­ing events (Lithua­nia), tri­lat­er­al Lithuania’s, Latvia’s and Estonia’s exer­cise Baltic Fortress 2012 (Lithua­nia), multi­na­tion­al seafloor mine clear­ance exer­cise Open Spir­it 2012 (Esto­nia), inter­na­tion­al exer­cise Bal­tops 2012 (cen­tral area of the Baltic Sea), inter­na­tion­al Baltic seafloor sweep­ing oper­a­tion (Esto­nia), inter­na­tion­al mil­i­tary exer­cise Danex/Northern Coasts 2012 (Ger­many, Den­mark) and BALTRON seafloor mine clear­ance oper­a­tion (Latvia). BALTRON (Baltic Naval Squadron) was estab­lished in 1998, the unit is formed by inter­na­tion­al staff pro­vid­ed by Lithua­nia, Latvia and Esto­nia. Tasks of BALTRON are the fol­low­ing: to con­duct search and neu­tral­iza­tion oper­a­tions of mines and undet­o­nat­ed ammu­ni­tion remain­ing in the Baltic Sea after World War I and World War II, and to strength­en secu­ri­ty of the Baltic ter­ri­to­r­i­al sea and the exclu­sive eco­nom­ic zone of the Baltic states. The unit also serves as train­ing plat­form before deploy­ment with NATO units. For the media: for more infor­ma­tion con­tact LITHNAVY CIMIC offi­cer Lt (N) Antanas Bren­cius, phone 00370 46 391 207, 00370 698 181 96.